A man was arrested for trying to cash a check from God. He had an invalid Bank One check written out to him for $50,000 signed “King Savior, King of Kings, Lord of Lords, Servant.” At first when I read this I thought, well, if God’s going to write a check why not go for a larger amount? Then I read that Kevin Russell had more checks written by God –one for $100,000. So I guess he decided to go for the lower amount so he didn’t look suspicious. He was charged with one count check fraud, one count intimidation and one count for resisting arrest. How long do you think it took the cashier to realize it was a fraudulent check? What is the count of intimidation mean? Was he threatening to go to God if they didn’t cash it? I wonder who’s going to defend him in court? I am a sucker for comebacks. I can’t help it. She was considered out of her league in American Idol by Simon Cowell, and the public listened to him. She ended up getting the last word. She reached a level higher than even Simon. She won an Oscar. I didn’t see very much of the Oscars last night. I wanted to see Ellen DeGeneres because she makes me laugh and I wanted to see Jennifer Hudson win–I missed both and ended up seeing the boring finale. I know if I were a true Hollywood junkie I would be raving about Martin Scorsese’s first Oscar but I don’t care too much. I get lost in that man’s eyebrows. I wanted to see Jennifer Hudson win because that girl’s got talent. And she did. And I’m glad. More on Community–is the blogosphere a real community? When I die I want someone to find my body quickly. I don’t want people to find me in front of a TV somewhat well preserved. Please check on me–please make sure I haven’t fallen into a very deep sleep watching repeats of Laverne and Shirley. If you haven’t noticed girls are growing up quite fast these days. Well, they appear to grow up fast. They are the same little bodies in “adult” wear. It’s quite scary. The other day my daughter was invited to a birthday party at a girls boutique. I knew my daughter would love the party, and I really didn’t think too much about it. When I went to pick her up she had a new little hairdo and a bright eye shadow on her eyes. I wasn’t too excited about walking downtown with my beauty pageant daughter, but didn’t expect some of the disapproving looks I got from the women I passed on the street. I don’t regret that my daughter went to the party, it was one day, but I did get reminded after reading this article that I need to make sure that she doesn’t get sucked into the whole tween marketing scheme. Who Wants to be Like Water? I’ve been frustrated with my blogstipation today. I’ve been writing, but it hasn’t been “post-able.” I had this great humor idea, but I couldn’t get the picture to be clear enough for anyone to see — because the humor was in the visual it had to be clear or it wouldn’t have been funny. But, let me tell you, if I could have gotten it to work you would have laughed, and laughed, and laughed and — okay, at least you would have smiled or grimaced. Before my funny attempt, I wrote two paragraphs of I-don’t-know-what. Yes, I hit the wall with a thud. My husband came to the computer in the midst of my angst, and I asked him what he wanted for dinner. He takes that to mean that I want him to make dinner; which he, of course, then interprets to mean he needs to go buy pizza. I went into the kitchen, opened the freezer and went back to my room. It seemed I was fresh out of any ideas on any thing, so I consulted a magazine I had laying around. I didn’t find any recipe ideas, but I read a great article. The article was in Real Simple February issue (2007) and was written by Gail Blanke, a life coach. She related a story about when she was a little girl and had returned home from a birthday party crying. She was upset because a friend didn’t like her. Her mom told her that the only thing everyone likes is water — because it has no taste. She then asked Gail if she wanted to be like water just so everyone would like her. A very simple concept I know, but it really hit home to me. I am new with this blog stuff and love that I am writing consistently again. However, I am also very competitive and a perfectionist (which is why writers so often drink heavily and use chemical stimulants) and want my blog to get tons of traffic. I often read different “experts” on blogging and sometimes implement their suggestions. Sometimes I feel like water (only no one needs me to sustain life) trying to please all the potential readers instead of being myself. Who am I? I’m a little bit country, I’m a little bit rock n roll — oh, no, that was Donny and Marie. I’m a humor writer because that is how I view the world. I also find such enjoyment just out of encouraging and motivating people; sometimes that works through humor and other times it’s in a different type of blog. So, the battle I find myself in is what kind of blog is this? Can I laugh at the world and offer advice and encouragement at the same time? Can I truly be myself in this crazy blogosphere or do I need to be water. I am not water–no way. I’m closer to a smoothie, but sometimes I’m a soothing cup of tea. Hopefully, I am always, a-muse-ing. What about you? Are you being yourself and what does that look like? There is only one you and, fortunately for the world, only one me! I don’t know if you have heard, but “Secret” is the word. Not talking about deodorant or the latest way to generate traffic on your blog. This is a book that has been talked about on Oprah (which means $$$ in book sales) and is also a DVD. 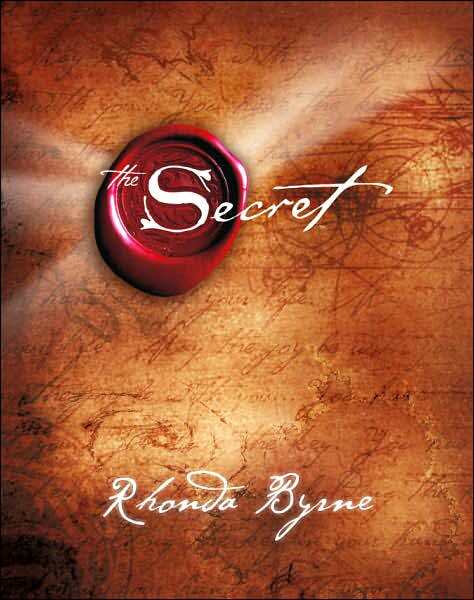 “The Secret” is book about the “law of attraction” –if you imagine it you can get it or “attract” it. The DVD is supposed to be better than the book, and very inspiring. Inspiring in that it encourages you to set goals and determine to achieve them. It also takes a look at some very intelligent people (like Einstein) who supposedly knew this secret and kept it a secret. I think “The Secret” that many people know is that anything worthwhile usually takes determination and hard work. The book is popular because people want to believe life has an easy formula–we think and it happens. This starts to break down when you consider people in South Africa dying with AIDS or victims of Katrina. Did they not think positively enough? They couldn’t control what happened to them, but they can control how they face life now. I tried to imagine that my teeth didn’t need any more dental work, but I still need to go to the dentist. Now if I imagined I didn’t need dental work when I was 10 years old and had a goal to stop eating candy and brushed my teeth more — I would have nicer teeth now! There is much to say about having a positive attitude and facing obstacles with a great outlook. Most of my posts are intended to make you smile or laugh. Why? Because, I believe, unlike the book, I can’t control my circumstances all of the time, but I can control my attitude. I can get angry and upset every time something horrible happens, or I can pick myself up and laugh. Sometimes the laughter takes a long time, but it will surface, it always does. I would like to do more than just make you laugh; hopefully I make you think a bit too. But, if all I do is give you a smile–I could think of worse things to do with my time.